AZ Regional Mix was formulated as a maintenance supplement to safely provide nutrients known to be typically needed with Arizona and Southwest hays without supplying excess amounts of any nutrient, and not include nutrients usually found in excess in regional hays (such as iron and, often, manganese). I originally formulated this custom mix for my own horses. Several friends began using it with good results and my trimmer began recommending it to her clients. Rod at HorseTech agreed to call the it AZ Regional Mix and added a section called Popular Custom Products to his website so it could be ordered online. AZ First Balance is a more intense version, supplying higher levels of minerals and some vitamins, with higher levels of biotin and added lysine and methionine for horses that need a "jump start", while still ensuring nutrient levels are kept withing KER and NRC guidelines for safety. After a cycle or two on First Balance, most horses can be transitioned to the less expensive Regional Mix for maintenance. Both these flax-based supplements are similar to many of the standard supplements offered by HorseTech but have been "tweaked" to provide a custom supplement that reflects the needs of the Southwest horse. The cost is comparable (and usually less) than many "off-the-shelf" supplements of similar quality. Despite the "AZ" in the name, these supplements are suitable for any part of the country where iron levels in hay are adequate to high and you want to feed a complete iron-free supplement without grain or alfalfa based fillers. • By phone from HorseTech – 1-800-831-3309. Many supplements will show the actual grams (g) or milligrams (mg) of a mineral per ounce, scoop or pound. But many only show a “guaranteed analysis” – either “%” or “ppm”. So if you want to know how much of a mineral is actually contained in the scoop, you need to do some math. The math is not difficult, but can be confusing at first. The same math can be used for converting bagged feed label nutrients and minerals into grams or mg.
Major Minerals are used in large amounts and are usually shown as percent (%), which equals grams (g) of elemental mineral per gram of compound (or product). The most confusing part is that the term “gram” is used both as the amount of mineral in a compound and as the total weight of the compound/product. I will use the abbreviation “g” for the elemental major mineral. There are 28.4 grams per ounce, so to see how many grams of calcium are in one ounce of the supplement, you would multiply 0.065 x 28.4. There are 1.8g of calcium in each ounce of this supplement. Trace Minerals are used in much smaller amounts – milligrams instead of grams. The term “ppm” (parts per million) is usually used to show how much of a trace mineral is contained in a supplement. PPM equals mg (milligram) of mineral per kg (kilogram) of product, so we will have to divide by 2.2 to get mg per pound and divide again by 16 to get mg per ounce. Hay can range from a low of 4% protein up to 14% or higher. If you've had your hay analyzed or have been able toget a good idea of your regional averages, you can tell if your hay is meeting your horse's protein requirement. For example, let's say your grass hay is 8% protein and your horse eats around 18 lbs of this hay each day. 8% / 100 x 453.6 = 36 grams of protein per pound. 36 x 18 = 648 grams of protein per day. You can see this will leave your horse short 172 grams of protein per day which he needs for good feet and to rebuild muscle, strong tendons and just about every other working part. So you go to the feed store to find him something to boost his protein - only to find that all the labels list protein as "%" with none of them telling you how many grams of protein there are in a "serving", and most likely the feeding directions say to "feed to condition" or "to maintain body weight". You also realize that he'll need at least 3 lbs/day of the 12% protein feed but only 2.3 lbs of the 16% protein feed so, with other things being equal, the 16% feed may be more cost effective. If you have questions or comments about anything written here please post them - just click on the Comments field at the end of the article (or at the end of this post) or you can email your comment to me at Desert Equine Balance. I will answer questions to the best of my ability - if I don't know or if the reply is "my opinion", I will let you know that and we can continue to learn together. I am not a certified or credentialed equine nutritionist but have spent most of the past six years learning all I could about equine nutrition - mainly by studying the wealth of material in the NRC, the KER library and publications, the Equine Cushing's group (under the guidance of Eleanor Kellon, VMD) and a select few "no-nonsense" websites. Working with owners of insulin resistant (IR), rescue and other problem horses has helped me expand and apply what I've learned. The information is out there for all to access but for most of us, our first encounter with the basics of equine nutrition is a bewildering array of tables, math and new terminology. I try to use my medical background as a paramedic and RN to translate "nutrition-ese" into plain talk that can help others understand and develop a sound feeding program for their horses. If I can help someone learn how to interpret feed bag tags and supplement labels, to understand their hay analysis, to develop a better working relationship with their veterinarian, to see the difference between magic bullets and sound nutrition, then all the hours I spend here will have been time well spent. Labels: Desert Equine Balance, Insulin Resistant, IR, magic bullet, Questions and Comments? So how do you figure out what your horse's requirements are? The NRC tables list minimum daily requirements for many nutrients based on weight, age, reporductive status and work level. The tables are available at the Equi-Analytical website by selecting "Nutrient Requirement Tables" from the "Putting Results to Work" menu. Enter your horse's body weight (the breed selection option roughly corresponds to expected body weights for that breed) then find the row that matches your horse's class and work level. These are "Minimum Daily Requirements" - similar to the human "MDR", they represent the amounts needed to prevent disease, not what is needed for optimal health and performance. More recent research indicates the requirements for many nutrients may be as much as 150% or more of the 1989 NRC recommendations. A good quality grass hay will provide most if not all of the protein, energy and most major mineral (calcium, phosphorus, potassium) needs except for magnesium and sodium, and most will provide suficient to excess iron. Copper, zinc, iodine and selenium will need to be supplemented. Hay quickly loses it's vitamin E content and hay stored longer than 6 months will begin losing it's vitamin A content. A healthy mature horse will synthesize it's own B-vitamins (including biotin) and only requires vitamin D if deprived of sun exposure. At the very least, a horse should be supplemented with the minimum levels of copper, zinc, iodine, selenium and vitamin E, with loose salt added. Hay analysis can provide a guideline to determine if higher levels of supplementation should be considered and if major minerals need adjustment. Plain - no molasses added. The only ingredient listed on the label will be "Beet Pulp". The sugar content of unmolassed Beet Pulp can range from 6% to 12% but is usually less than 10%. Molasses added. The label will list "Beet Pulp" and "Molasses". The sugar content of molassed Beet Pulp can run from around 12% to higher than 20%. Small amounts of molasses may be added for dust control without being listed on the ingredient tag. Beet Pulp "shreds" usually have no further processing after the sugar is removed, some shreds are chopped before being bagged. Size can vary from a "rough chop" to larger bark-like flat pieces. Beet Pulp pellets are shreds that have been finely chopped and formed into pellets. SpeediBeet is a brand of micronized (extremely finely chopped) beet pulp which absorbs water very quickly. Popular in the UK, it is slowly becoming available in the US. A half pound (dry weight before soaking) of plain Beet Pulp makes a good low-carbohydrate carrier for supplements. This would be in the range of a couple of handfuls of pellets or a little more than half of a 1lb coffee can of shreds. This is the amount often used to replace a higher sugar/starch "prepared" feed. Feeding a pound or two (dry weight) of Beet Pulp will help maintain weight and 3 to 4 pounds or more will help with weight gain without increasing starch levels as grain does. Because of its high fiber content, it can be used as 25-40% of the ration for horses who have difficulty chewing. Beet Pulp shreds can be fed without soaking - this has long been a practice at race tracks. Dry shreds are no more likely to cause choke than any other dry feed however most horses (and their humans) prefer them soaked, or at least moistened. Some shreds will soak up in as little as ten minutes in warm water; twenty to thirty minutes is usually adequate. Beet Pulp pellets tend to be much harder than other pellets and it is strongly suggested they be fully soaked. They will soften up in an hour or two depending on the brand and temperature and will expand up to 10 times their original volume in 4-8 hours. It's really difficult to describe if you've never seen it. Caution - I've soaked beet pulp up to 12 hours without any problem but have heard others report it getting "sour" if left too long, especially in warm weather. You can start soaking in the morning for an evening feed (and in the evening for a morning feed), keeping it out of the sun. I like to drain the soaked beet pulp (I use a mesh colander) and will also rinse if the dry beet pulp was very dusty or if I think it might have a bit of molasses in it. If I notice a horse isn't drinking as well as I'd like, I will sometimes add some water back in and serve his beet pulp as a "soup". You can then add supplements, salt and other "stuff" (I toss in a handful of Timothy pellets) either top dressed or stirred in. 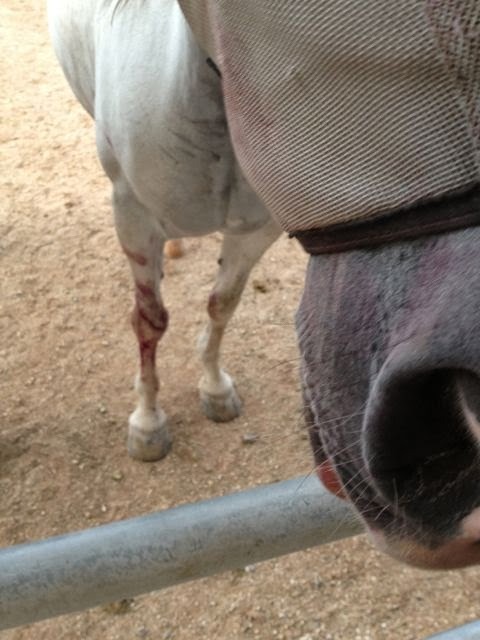 Some horses will initially turn up their nose at beet pulp and will take some acclimating. It can help to start with just a little added to something they already like, then gradually increase the beet pulp while decreasing the other feed to make the transition. I've personally never encountered this - every horse I've given beet pulp to just dived right in. But if your horse needs a taste tempter, Megan's website page on Natural Flavorings has some good ideas. Boarding your horse always makes controlling your horse’s diet harder but many have found ways to work beet pulp into the routine. If you can get to the barn daily, soak the beet pulp at home or at work (a small cooler can work well for soaking and transporting). You can do this once a week or so and keep it in baggies in your freezer, ready for a quick grab on your way out the door. While “soak/drain/rinse” is ideal to remove surface iron, dust and residual sugar, the draining/rinsing could be skipped if your beet pulp is unmolassed and relatively dust free. If the barn owner is willing to help, make it easy for them. Pre-measure the beet pulp and your supplements into baggies, provide a large closed bucket or other container to keep your stuff neat and together. If needed, provide the bucket for soaking, a colander for draining, a metal sweat scraper for stirring. And be willing to offer paying a bit extra for this service. Beet pulp is not “necessary” but is a low sugar/low starch alternative to bagged feeds and grain or can be used as a substitute for some of the hay ration (especially if you need to replace some high sugar/starch hay) and is well accepted by most horses. It doesn’t take long to get into a routine and the benefits usually outweigh any inconvenience. Don't forget to check out Beet Pulp I - You want me to eat WHAT??? if you came here to Part II first. Beet Pulp I - You want me to eat WHAT??? The National Research Council (NRC) was organized by the National Academy of Sciences, "a private, nonprofit, self-prepetuating society of distinguished scholars engaged in scientific and engineering research, dedicated to the furtherance of science and technology and to their use for the general welfare" for the purpose of furthering knowledge and advising the federal government. The NRC Committee on Animal Nutrition produced the current 5th revised edition of Nutrient Requirements of Horses in 1989 (referred to as "NRC"). Though there have been many advances in equine nutrition since then, this edition is still the basis for most equine nutrition reference. The NRC outlines most of the known nutrient requirements for horses by weight, age, work level and reproductive status. It includes tables listing the minimum requirements, discussions of each of the nutrients listed, and maximum tolerance levels. The requirements stated in the NRC "...indicate the minimum amounts needed to sustain normal health, production, and performance of horses" based on research available at the time. As it may be some time before the new requirements are made available, the current edition is still a valuable resource. It can be ordered (softcover) online or viewed in it's entirety for free at National Adademy Press . Kentucky Equine Research (KER) was established in 1989 and has hosted numerous nutrition conferences since then. The proceedings of these conferences have been compiled in three volumes, Advances in Equine Nutrition I, II & III, plus the Proceedings of the 2004 Equine Nutrition Conference that includes discussion of the "New Horse NRC. These volumes present much of the equine nutritional research that has occurred since the current NRC was published and provide a source of more recent information for determining what to recommend in the equine diet. Many of the Proceedings articles can be viewed online at Kentucky Equine Research in the KER library, or the volumes can be purchased there. How Much Iodine Does My Horse Need? The requirement for iodine in equine rations has been estimated from other species requirements and by evaluating thyroid function. Iodine intake in humans is monitored by testing renal (urine) levels, but normal standards have not been established for equines. Most geographical standards for iodine are mapped based on iodine deficiency in humans; this is unreliable in North America, as the use of iodized salt for human consumption has resulted in a low occurrence of iodine deficiency that does not reflect deficiencies in food sources. National Research Council (NRC) requirements (1989, page 16) for iodine for horses are estimated to be from 0.1 to 0.6mg/kg diet. That would be 0.9 to 5.4mg/day for a horse eating 20lbs of hay. Researchers at Kentucky Equine Research are currently proposing a range of 1.75 to 3.0mg/day for a 500kg (1100lb) horse depending on work level. Eleanor Kellon, VMD, in Equine Supplements & Nutraceuticals (1998) recommended up to 5mg/day, depending on activity. On the Equine Cushing’s list, Dr. Kellon has suggested 2.5mg iodine/day per 500lbs body weight (or 5.5mg/day for an 1100lb horse) which is consistent with the NRC recommendations. Thyroid panel levels have shown improvement (from below or low normal to mid normal ranges) on this level of supplementation. NRC estimates the toxic level of iodine to be 5ppm (5mg/kg of diet), or approximately 45-50mg per 20lbs of dry matter fed. Studies cited in Advances in Equine Nutrition I, II & II (Kentucky Equine Research, 2005) indicate that mares produced foals with goiter when fed diets containing 50mg iodine per day, but points out that the analyses of daily iodine intake might not have been accurate and the actual amounts fed may have been higher. Kelp and other marine products can contain excessively high levels of iodine – a study in the British Journal of Nutrition (1994) showed some edible seaweeds with iodine levels as high as 2,660,000 mcg/kg - or up to 75mg per ounce. An earlier study cited by NRC indicates kelp may contain up to 1850mg iodine per kg (52.5mg/oz). While some quality kelp or other marine plant based supplements are assayed to guarantee safe levels (and these levels are indicated on labels) as these are not regulated there is no requirement to assure safe levels are not exceeded. Source is made from seaweed, not kelp, and has a guaranteed analysis of iodine (min) 660ppm (18.75mg per ounce). Their recommended feeding rate (one ½ ounce scoop) will provide approximately 9.3mg of iodine, one half scoop will provide approximately 4.7mg of iodine. For accuracy, any supplement should be fed by weight, not volume, as “kitchen” or other volume measuring devices (teaspoons, tablespoons, scoops, cups, etc) can vary considerably. However, using different scales and a variety of common kitchen measuring teaspoons to weigh three different brands of salt, I found 1 ounce of iodized table salt averaged to approximately 4 teaspoons by volume. If iodized salt is fed at the rate of 1-1/2 to 2oz/day, these amounts will provide minimum “insurance” levels of iodine (approximately 2-5mg) for a full size horse eating 18-22lbs of hay a day while remaining well below excessive levels. Testing forage for iodine levels is difficult and expensive. Larry Berger, PhD, University of Illinois, writes in “Trace Minerals for the Animal Nutrition Professional” (Salt Institute 1994/95) that iodized salt be fed in all areas of the United States and that diets containing soybean meal, cottonseed meal and canola meal increase the requirement for iodine. Another possible concern in many areas of Arizona is the use of Colorado River water blended into drinking water supplies and used as irrigation water. While the overall effect is not yet known, this water has been shown to be contaminated with perchlorate, which inhibits uptake of iodide to the thyroid (Santa Ana Watershed Project Authority, FY2004/05). If there is any concern about using the upper levels of iodine suggested above, at least the minimum NRC level of 0.1ppm (0.1mg/kg dry matter) or approximately 1mg of iodine per 20lbs of hay should be provided by feeding ½ oz of iodized salt, with the remainder of the horse's salt requirement being provided by an additional 1 to 1-1/2 oz plain salt. Horses with below or low normal thyroid panel results may benefit from the higher levels of iodine. Serum iodine level testing is available in Europe, but I did not find any US animal lab references for either serum or urine iodine levels. Thyroid function (full thyroid panel) is the standard method currently used to indirectly evaluate iodine status in the US. A friend emailed me recently about my opinion whether minerals from plant sources are really superior to minerals that come from "rocks". This was my very basic reply. Gee - ALL minerals originally came from "rocks". Inorganic minerals (sulfates, oxides, etc.) are basically the forms/compounds as they occur in nature (most elements combine in nature with other elements to form a "compound" such as copper plus iron plus sulfide equals chalcopyrite which we process to get the compound "copper sulfate"). They then pretty much hang around until nature or man works on them. These compounds when mined and processed are graded according to purity - pharmaceutical grade being the purest, followed by food grade, feed grade, etc. Minerals are natural compounds formed through geological processes. The term "mineral" encompasses not only the material's chemical composition but also the mineral's structure. Minerals range in composition from pure elements and simple salts to very complex silicates with thousands of known forms (organic compounds are usually excluded). Chelation (from Greek χηλή, chelè, meaning claw) is the process of reversible binding (complexation) of a ligand - the chelant, chelator, chelating agent, sequestering agent, or complexing agent - to a metal ion, forming a metal complex, the chelate. The term is generally reserved for complexes in which the metal ion is bound to two or more atoms of the chelating agent, although the bonds may be any combination of coordination or ionic bonds. Through the process of digestion, the body is capable of breaking the chemical bonds of ingested compounds and attaching them to protein molecules, making them available for absorption. Thus, the body is able to utilize the "inorganic" forms of minerals (the digestive system does a form of "chelation" here). Chelated minerals, often referred to as "organic" minerals, are simply mineral salts (dissolved metal ions) that have been attached, or bonded, to proteins, polysaccharides or amino acids. They are available as "proteinated" minerals which are attached to a basic protein molecule or as minerals that have been attached to specific or complex amino acids. The two main manufacturers of chelated minerals used in equine supplements are Truow Nutrition (Optimin) and ZinPro. Both make a variety of proteinated, poly and amino acid complexed minerals, available as single minerals or in combinations, which in turn, are used by the supplement manufacturers. No matter what brand of supplement you buy, the actual minerals used are most likely manufactured by Truow or ZinPro. The concept is that chelated minerals are protected from competition for absorption and are delivered to the area where they will be best absorbed. A downside, if the bond is too strong, is that they might bypass the optimal absorption site in the digestive tract. Most studies on equine mineral requirements have been made with the inorganic forms of minerals. There are conflicting studies on whether or not chelation actually enhances absorption and utilization. There's also the (remote) possibility that chelation could bypass the body's ability to NOT absorb excess minerals. The concept that a supplement providing minerals from plant sources as superior is a bit questionable. True, eating plants will provide minerals in a more "natural" form - the plant has integrated the minerals dissolved from the soil into it's cells. This usually provides sufficient (often excess) calcium and some other major minerals but looking at the level of trace minerals such as copper, most available foodstuffs don't provide sufficient amounts of many micro minerals. The horse (or other animal) still has to process the minerals by attaching them to proteins to be absorbed. In order to put these "plant minerals" into a supplement, they would have to process the plant material to extract the minerals from the plants to turn them into a usable form - which would put them right back into an inorganic form. Horses evolved eating plains grasses with only nature’s supplements. Our modern horses’ diet today should still be based on grass and hay for the foundation. But forage has changed since horses roamed the plains and our pastures and hay may be lacking in essential nutrients. • We can send a hay sample to a forage laboratory for analysis. Using a regional “average” can work for most healthy horses when we are mainly concerned that the major minerals are reasonably balanced and they are receiving at least the basic requirements for protein, energy, vitamins and trace minerals. It’s a useful approach if hay comes from different suppliers in small amounts. Horses with special needs related to growth, health, performance, reproductive status or advanced age will benefit from having their ration more tightly balanced to avoid problems. Using the hay analysis results or a regional average, we can see if the forage meets the horse’s requirements. The guidelines established by the National Research Council (NRC) combined with mineral balancing guidelines based on more recent research, can help us determine what is needed to address deficiencies and avoid over supplementation. After reviewing the analysis results, we can select a supplement that will complement the horse’s forage. This may be a “Regional” supplement which has been custom blended to work with our area hays, an “over the counter” supplement with appropriate mineral levels, or it may be a “Custom Mix” formulated specifically to work with the hay you had analyzed. We can also determine if additional concentrates need to be included to improve protein, major mineral or fat content. This could range from a simple hay pellet or straight grain to a commercial concentrate feed. Is your horse “nutritionally challenged”? There is no “one size fits all” feeding program but there are simple and effective ways to work with hard keepers, “air ferns”, and other horses with special nutritional needs. Horses with laminitis, Cushing’s Disease, Insulin Resistance or other metabolic conditions may have additional requirements needing a more targeted approach. Mares and foals have increased requirements for many nutrients which can affect critical developmental phases. Performance horses often require more of everything - energy, protein, minerals - the right nutrients balanced in the correct amounts to feed the work. Any nutrition recommendations and suggestions should be shared with your veterinarian and other equine practitioners you may be working with. It’s in your horse’s best interest if we’re all working together as a team. A variety of herbs is often used to improve or maintain the health of your horse. Many herbs have powerful and potent actions similar to drugs and should be used only under the guidance of a certified herbalist (ideally, also a veterinarian). .
Nopales (prickly pear cactus pads) - for horses? You want me to eat WHAT? I thought Beet Pulp was the last straw - even though it is now one of my favorite foods - but now you're telling me to hang out in the desert and eat cactus? This nouveau California cuisine may be OK for humans and burros - but I'm an elite equine and expect only the best. OK, OK - I know I've been eating all the prickly pear cactus I can find all summer and that I look good and my coat is shiny but I thought that was because of the yummy hay you've been finding for us and that nice flax stuff you mix in with our beet pulp. But I have noticed that Choli keeps her girlish figure and wants to play a lot more when she munches on cactus all summer long. We won't tell you our secret, but you've noticed we never seem to have a problem with the "prickly" part, haven't you. Well, even though we suspected that it might be good for us (the good stuff does seem to also be the yummy stuff) we'll go on just thinking of all that cactus as dessert. So what if it's got lots of vitamins, antioxidants, gooey mucilage (isn't that glue?) and pectin that makes our tummies feel good, plus antiinflammatory action that keeps us limber. And I guess it does help with glucose metabolism 'cause that's Choli's problem, right? A nutrition summary for Nopales (prickly pear cactus pads) can be seen at NutritionData.com. The website of Nopal Export (no longer active) outlines some of the "health benefits" of Nopales (as producers, they are admittedly biased).The benefits of primary interest for horses include GI tract protection provided by fiber, mucilage and pectins, lowering of blood lipids and improvement of insulin sensitivity. The pads are low in sugar/starch and high in fiber, which contributes to them being a "safer" forage for insulin resistant horses. A PubMed search of "prickly pear" brings up 150 results with many looking at the potential for prickly pear (Opuntia ficus indica) to reduce inflammation by inhibition of iNOS (inflammatory nitric oxide synthase) and antioxidant activity, healing of ulcers and lowering of plasma lipid levels. These studies have been done in humans and other species - there have been no studies or actual field trials done in horses that I am aware of. The nutritional benefits seem to be present in both the pads and the fruit (the "pear"). It is a bit of a shock the first time you see a red mouth (or try to clean those white front socks) when the fruit ripens in early summer but you can relax knowing a little desert "dessert" is possibly good for your horse. My "one rat" study is just an observation that my insulin resistant mare looks and feels better when she is chowing down on summer's abundance of prickly pear. So one morning while I should have been fixing the kitchen drain or catching up on my charting or cleaning the corral, I'd been answering posts on the Equine Cushings Group which is what I really want to be doing. 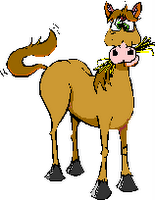 Horses evolved eating grasses and their bodies are built to get calories/energy from the digestible fiber in grasses (hay). Generally, that's all they need to stay fit an healthy. 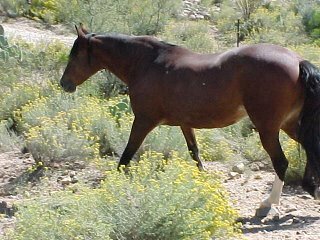 The healthiest horses I have seen in the past few years are a herd of Morgans running on desert acreage where they have to work for their grass (they get a little supplemental hay and also forage on mesquite and cactus). You have seen these horses in movies and TV and in TV commercials - they are gorgeous, fit and have great feet. They also work hard. Some of them are old - over 20 - fit, healthy and working. Unless you are plowing, driving/riding your horse to the grocery store or to work (with your horse pulling the cart), racing, eventing or training for endurance, your horse probably doesn't need any grain or commercial feed. What we humans need is another matter - the feed companies have done a good job convincing us our horses will die if we don't give them Brand X. Treats are for us, they make us geel good. My personal wording preference - grain is oats, barley, corn, etc. Concentrate is any mix of grain or other commercial feed (ie - grain is a "bad" word for an IR horse, "concentrate" may be OK). Your horse does need certain known levels of nutrients (protein, major minerals, trace minerals, vitamins, fiber). Sugar and starch aren't on this list. Most (but not all) hay really does provide the required protein, calcium and energy for a horse at maintenance or in light work. Almost all hay provides more than enough iron. Most are low in copper and zinc and magnesium. Because we know what a horse's requirements are and we can test the hay, we can figure out what's high and low and adjust it. You want to feed the best quality hay you can find and afford. Good quality hay has adequate but not excessive protein, energy and calcium, low iron, low NSC (sugar/starch) and does not have high levels of potentially toxic minerals (aluminum, etc). Nice if it smells and tastes good, too. "Poor" quality hay makes good bedding. Most of the horses on [the EC] list will do very nicely on just low NSC hay, a half pound of plain soaked beet pulp and a good iron-free supplement, with a little extra flax, magnesium and vitamin E and some cinnamon. Some need their minerals balanced very tightly, and some hay deficiencies will creep up on us (like Sue's hay with the inverted calcium/phosphorus ratio - which we wouldn't know about if she hadn't tested her hay). Most Cushing's horses need meds, and there are some "special needs" horses. Contrary to advertising claims, "magic bullet" supplements and potions won't fix your horse's laminitis. You need DDT/E - Diagnosis, Diet, Trim and Exercise. My personal opinion again - if you give your horse herbs, you should know what they are, what they do, how they work, where they came from and possible side effects. You won't kill your horse if you can't figure out all this stuff in one day. It's taken Mandy, Kathleen, Abbey, Susie G, Beth and the other regulars [on the EC list] a few years, under Dr. K's guidance, and they're all still in learning mode. BUT - your horse will get better faster if you follow their suggestions. And Most Important - Dr. Eleanor Kellon is an angel and this list (and many of our horses) wouldn't be here if it weren't for her. One of the things I want to do when I'm free of the house and FT work is devote a lot of time to the Cushing's list and Desert Equine Balance - it will be so nice to be able to work on them again without feeling guilty because I'm letting something else go.